Are you still looking for that perfect gift for someone in your life? 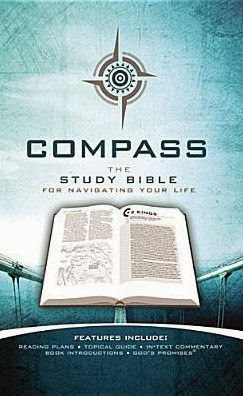 If you have a friend or family member who is in need of a Bible, I can highly recommend the Compass Study Bible. With the birth of technology, I have mainly done most of my bible reading on an app via my phone. However, I still miss holding books in my hand, and since I am a visual learner, it helps to have something directly in front of me that is more tangible than my phone. I like the Compass Study Bible because if you aren't sure where to start reading or applying the Bible in your life, it is a guide to doing that. I also love that it has notes as I am someone who needs an explanation behind the verse. If you like reading plans, this Bible has a 365 day read through the Bible just for you. One of my favorite parts of this Bible is the topical guide based off of scripture and notes, so you can look up verses on whatever you need for that particular time in your life. Overall, if you are missing reading the Bible, or need to gift one to a friend, I recommend the Compass Study Bible! Disclaimer: *The featured product(s) in this post were provided for me by Shelton Interactive. I was not compensated in any way. All opinions expressed in this review are my own and not influenced in any way by anyone.